With InstaForex Company traders who prefer receiving floating bonuses on each deposit rather than fixed ones can enjoy up to 55% bonuses on the regular basis. 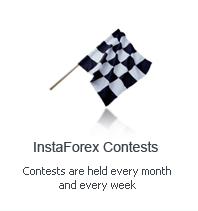 While some other brokerage companies provide such bonuses on a concealed term that they cannot be used in trading, InstaForex Company declares the freedom to trade with bonuses. A client can get a bonus at his/her convenience, since bonuses are credited automatically. The InstaWallet system allows any client of InstaForex to transfer funds to the accounts of other account holders. The internal transfers between trading accounts are processed within the system. InstaWallet users can send money to the accounts of their friends, relatives and acquaintances. The transfers are processed fast; it takes not more than one second. For InstaForex clients who activated InstaWallet service the transfers are available now! ForexCopy is an innovative service which doesn´t have any analogues in the forex world. It was developed by InstaForex. The idea is to copy positions of successful traders with certain set up parameters in real time mode. This service is available to any client who has an account with InstaForex. VPS hosting is the top innovation developed by InstaForex. It was created only for the company´s clients. This new service is beneficial for those who are interested in forex trading. Our clients are offered the most favorable price in comparison with other hosting services available on the forex market. We guarantee the fastest server which provides most of the needed functionality. The company improved technical capacity of the VPS hosting servers for the all available plans by doubling the number of processor units.